Tim Henman suffered another desperate Wimbledon disappointment as he came back from two sets down only to lose in the fifth to Spain's Feliciano Lopez. 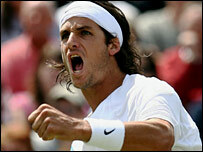 The Briton, playing his 14th Wimbledon, looked doomed at two sets and a break down but found his best form to level. However, it was Lopez who grabbed the key break at the start of the decider and went on to win 7-6 (7-3) 7-6 (7-5) 3-6 2-6 6-1. The 25-year-old will face France's Jo-Wilfried Tsonga in the last 32. "The first two sets l felt pretty solid," said Henman. "You play two sets with no breaks and you've just got to keep hanging in there. "The latter part of the third and fourth his game dropped considerably. I kept staying positive but knew when it got into the fifth I'd got to maintain the momentum. "Suddenly he hits two or three good shots in one game and he's in the driving seat. It certainly wasn't through lack of concentration at that moment." After defeating Carlos Moya 13-11 in the fifth set in his first match, Henman was in action for the fourth straight day as he and Lopez resumed their rain-delayed match at 1-1. The two are among a select band of players that rate grass as their favourite surface and it was a rare sight to see two serve-volleyers going head to head. A tight first two sets came down to tie-breaks, and Lopez deservedly took both. The first was decided when Henman double-faulted to fall 6-3 behind, and Lopez missed five break points in set two before racing 5-0 clear in the tie-break and holding off a mini fightback to take it. The match looked as good as over when Lopez got an early break in the third but Henman finally grabbed the initiative when he broke back, glaring at Lopez from the net as he took the key point. A sublime backhand winner helped Henman to a 4-2 lead and he served out surprisingly confidently, bearing in mind his past record and the edginess of the crowd. With the scores level and the crowd in full voice, Lopez headed for the locker room at the changeover. It proved a wise move as he returned to break Henman straight away. And with the energy of the third and fourth sets long gone there was nothing Henman could do to stop Lopez wrapping up victory in three hours 17 minutes. "Down two sets to love I'm not in a great position but I really felt like my game was there," said Henman. "I really did believe he wouldn't keep playing like that. In that respect I was right." 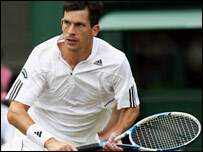 And asked if he would be back next year, Henman replied: "Absolutely." Lopez said: "I feel sorry for the fans because they love him and support him but when you go out there you want to win. "It's very disappointing for him to lose with 15,000 people supporting him."